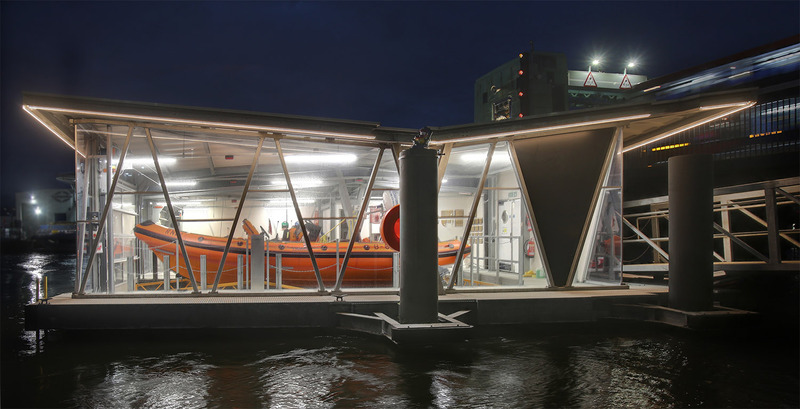 The ecological constraints (SSSI) as well as testing marine environment (building on the water) created a challenging project but has resulted in the completion of this lifeboat facility for two RNLI boats and crew. We achieved planning permission and designed this unique floating boathouse on Poole Quay for this local charity and major local employer. The design of the lightweight roof structure appears to float above the boats and is influenced by the shapes of the structures in and around the port. The angled roof provides views into the building from Poole Bridge, giving ‘transparency’ to the invaluable work the RNLI do. The planning application had to address heritage issues as well as environmentally sensitive issues. The biggest challenge for our architects was creating a beautiful lightweight building which still fulfilled the clients brief by providing the facilities needed which included boat cranes and staff accommodation.